Are You Awake or Asleep in the Light? Have you ever been traveling on business or on a tight schedule? As a pastor at times I have found myself at conferences and when the day is over I go back to my hotel room and call the front desk to ask for a wakeup call. Most adults have done that at one time or another just to make sure we do not over sleep so we ready for the demanding schedule of the next morning. Some people are night owls, others are early birds, but we all have had those longs days when we are just wiped out from the activity of day and we look forward to a good sleep. But because we have to be ready early we need that wake up call from someone else so we make sure we are up in time to be ready for the next day. Just last week I had planned to be up to attend a 6:30 a.m. prayer meeting. It was about a 15 minute drive away. I set my alarm for 5 a.m. and even a second follow up wake up call for 5:30. That morning when I finally realized what time it was I had had sleep through 1 of my wakeup alarms and then had to decide if I would push it and still make it in time or just forget it? I decided to go for it and rushed through the bathroom, dressed and out the door. When I arrived it was 6:30 exactly. I was close to being late, but I wasn’t. I must admit there have been others times and more then I really want to admit when I was not early or on time, but late. Sometimes it’s just not right to enter certain things late and almost better to just skip. The point is a wakeup call is to help prepare us to be READY and up in time from any deep sleep we might find ourselves in. In Noah’s Day before the flood the scriptures tell us that Noah was a preacher of righteousness and preached God’s wakeup call of judgment right up until the ‘Day’ that they entered the Ark. 2 Peter 2:5 if he did not spare the ancient world when he brought the flood on its ungodly people, but protected Noah, a preacher of righteousness, and seven others. We see that before every judgment in history God gives a wakeup call so people can prepare for what is next. When the disciples were with Jesus they asked him how they would know when He was returning. He gave them tons of clues. In Matthew 24 he covered basically the fall of Jerusalem in 70 A.D. right up until the last of souls are judged and are condemned to Hell at the end of history as we know it. After all those details he told a story about the Church by comparing the church as a bride with him as a groom. In that story in Matthew chapter 25 he mentions 5 virgins who woke up in plenty of time to be prepared and 5 virgins who missed the wake up call and over slept and hurried up but actually missed the arrival of the groom. So let me ask you something personal. Are you really focused, ready and looking forward to the day when He appears? Are you even looking for the signs of His coming that he shared with a sense of anticipation? Or are you sleepy, goofing off and not really too concerned about eternal matters or what true condition your soul is in because life is just busy and things must go on. 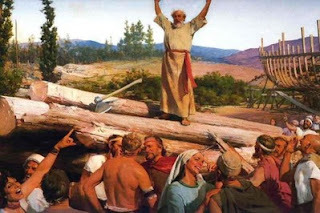 Before the Flood there was righteous Noah a preacher preparing himself & preaching to people a message. There is no question people knew about the flood mentioned by the mere fact that he was building a huge vessel that expecting to float. The people of that time were warned and given opportunity to change. When God decided to finally judge Sodom and Gomorrah he let Abram know about it first and he finally went to warn the people there but could only seem to convince Lot and his family to flee the calamity coming there. Are we living in a time and season that God is speaking to the church? What are our warnings today? Are we acting like the earth is our home or heaven is our home? Are we truly awake yet? Are God’s people and spiritual matters our top priorities? Or are we self-consumed and with no time to read, pray and connect in worship and fellowship with His people and what his prophets are saying today? Are we talking and witnessing to those we know and love with a message of urgency? Will you and I be alert before He comes back? Are we truly ready and waiting for when He returns? Or will we be asleep in the light not even aware of the signs of the times and just doing our own thing? Will we be among those who knew He was coming back, but got distracted by the cares of life and our oil lamps ran out of oil? To be honest I would like to assume we who claim Christ were among the 5 virgins ready and waiting, but Jesus told that story to the disciples so they and we would realize that some who could be awake in time were not ready. It is a warning to the church to be awake in time. In just my lifetime alone I can see the gradual slumbering of the church over issues of the day. I have listened to people who claim to be Christian people who actual have fallen asleep over changing doctrines and morals of the day. Good people who should say gay marriage is wrong are saying it’s not my business and it’s ok with me if they want to live that way. Or it’s ok if someone wants to get drunk. Or it’s ok to be entertained by the latest movies like Harry Potter and similar from Hollywood. Or its ok to believe in evolution since most of the world does now. The list of things that good people have accepted in this day were never tolerated even just a few decades or two ago. People in our country and in the world are slumbering off into ease. People who at one time felt that a Christian needed to be with other Christians in worship, prayer and study several times a week are fine if they just get together once or twice a month. After all, people are just busier today than they used to be. The list could go on and on with how we as a people are far more asleep over spiritual matters, moral issues then we once were. If we are closer to the return of Christ shouldn't we be wide awake and DOING THE WORKS OF OUR FATHER? I want you to know that I include myself in this article. I must ask myself how asleep I have allowed myself to become. Am I the most alert preacher proclaiming the most soul stirring messages regardless of the favor of man or not? Am I more interested in preaching the truth of the times and God’s Word or finding acceptance among men? How do we prepare for what God is doing in our day? What kind of mindset should we have? What kind of preparations should we put into motion now? What should our lives look like if the return Christ were tomorrow? Is it about having enough food and supplies like people felt on the eve of Y2K or is it something else? When 9/11 happened was it a wakeup call for America and the world to get ready? Did we get ready or did we fall back asleep? Had we gotten ready a decade ago would we be in the mess our country, culture and world finds itself today? Are you more prepared to stay on earth then to leave for glory? Keith Green is a deceased Christian artist from the 80’s who sang a song to describe what I believe is the condition in large part of the present state of church of our time. You close your eyes and pretend the job's done. And you just lay back and keep soaking it in, oh, can't you see it's such sin? Cause Jesus came to your door, you've left Him out on the streets. Oh, can't you see it's such sin? Don't close your eyes, don't pretend the job's done.